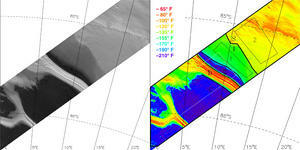 THEMIS images have provided the first direct observations of exposed water ice at the southern polar cap of Mars. 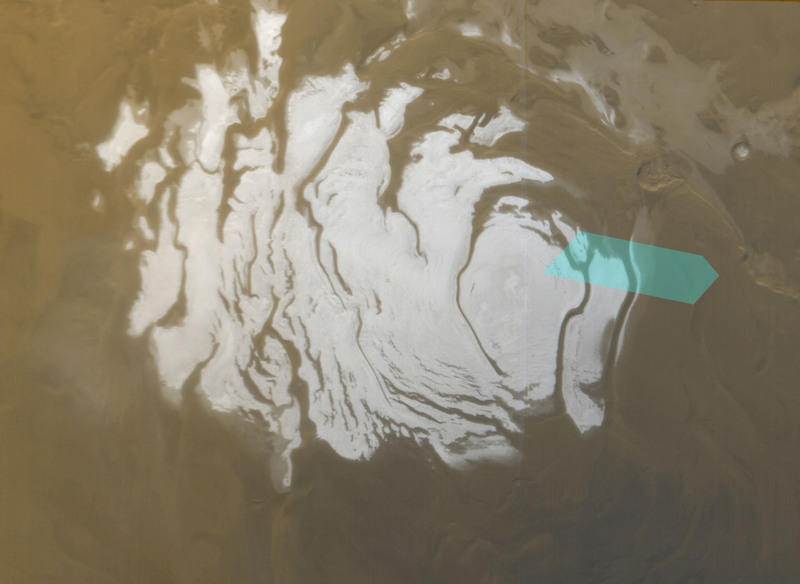 Finding water ice in a martian polar cap should come as no surprise. But when the Thermal Emission Imaging System (THEMIS) on the Mars Odyssey orbiter did just that at the planet's south pole, the discovery overturned a long-standing theory regarding Mars and its ice caps. The story begins four decades ago, following the first spacecraft visits to Mars. These portrayed a planet with a bitterly cold climate, especially in its polar regions. Temperatures there drop low enough that not only water, but carbon dioxide gas can freeze out of the air, making Mars a planet where two kinds of ice exist. These findings led scientists to develop a theory that the martian atmosphere - which is 95% carbon dioxide (CO2) - was closely tied to carbon dioxide ("dry") ice in the planet's polar caps. As the martian year rolls around, so the theory went, the onset of winter for one pole starts carbon-dioxide frost and snow condensing from the atmosphere. This seasonal layer vanishes back into the atmosphere when spring warms into summer. By the time autumn approaches again, what's left is only a perennial polar cap that endures from year to year. Mars' atmosphere undergoes a 30% change in density and pressure during the year. Scientists explained the variations by calculating they arose as the seasonal layer of CO2 ice came and went. It acted as a reservoir, or buffer, alternately storing and giving off quantities of CO2 throughout the year. Observations with the Viking spacecraft in the 1970s showed that in the north, the seasonal carbon-dioxide cover is only about a yard (meter) thick. This disappears completely each summer, leaving a perennial polar cap entirely of water ice. In the south, however, scientists thought the seasonal CO2 deposit lay on top of a much thicker CO2 cap that in turn covered a water-ice cap. In February 2002, however, the Thermal Emission Imaging System (THEMIS) on the Mars Odyssey orbiter imaged the south polar cap's edge in late summer. Taken at heat-sensing infrared wavelengths, the image mapped temperatures along the swath of ground. As expected, much of the image shows a polar covering of CO2 ice, while well away from the polar cap, THEMIS detected warm ground that scientists interpret as dry soil. Between the two, however, lies a patch of ground with a temperature of –88° C (–126° F). This falls between the polar cap's values and those of the surrounding soil. In their computer models, the THEMIS scientists find the best explanation for this patch of ground is water ice with a thin coating of dust. Moreover, the geologic unit with the water ice appears to be same as a unit mapped previously that is widespread around the polar cap. The THEMIS discovery therefore shows a perennial south polar cap and surroundings contain a large amount of water ice. In the same issue of Science where the THEMIS results appear is a paper by Shane Byrne and Andrew Ingersoll of Caltech that supports the findings. Byrne and Ingersoll studied erosion features in the south pole's perennial cap. They conclude the cap has two layers: the uppermost is a CO2 layer with a thickness of only about 8 meters (26 feet), while below this veneer lies water ice. This indicates the south polar cap, just like the north, is almost entirely water ice. There appears to be no large perennial CO2 ice cap, even in the south. The THEMIS team notes the discovery of water ice around and within the south polar cap is important in studying Mars as a planet and perhaps also for human exploration, which might one day tap into the subsurface water. "We looked through 'windows' in the CO2 and saw water ice," says THEMIS scientist Phillip Christensen of Arizona State University. Apart from the poles, the team observes, few exposures of water ice exist anywhere else on Mars. Byrne, S. and A.P. Ingersoll, A sublimation model for martian south polar ice features, Science, 299, 1051-1053, 2003. Mars' southern pole shines in summer sunlight in April 2000. Atop a thick water-ice cap lies a thin covering of carbon-dioxide ice. THEMIS found water ice in the ground within the area outlined in light blue-green. THEMIS found water by measuring temperatures at the edge of the south polar cap along a swath 32 kilometers (20 miles) wide. 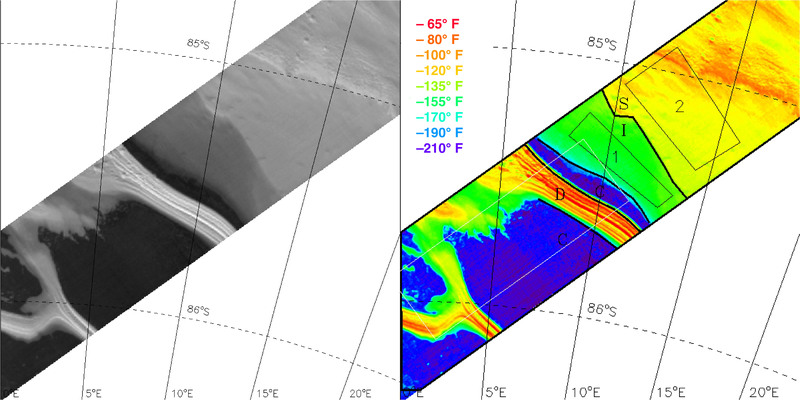 The left image is THEMIS' daytime infrared view (image I00910002); the same image, color-coded by temperature, is on the right. Green indicates water ice (I), S is dry soil, C is CO2 ice, and D is a warm, dark, dusty layered unit cutting into the polar cap. Areas 1 and 2 were regions studied for seasonal changes.